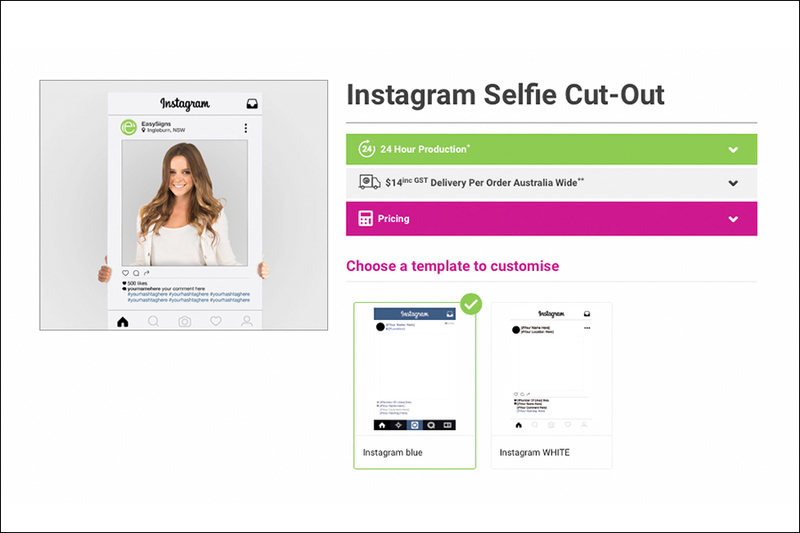 We have launched our revolutionary design tool to make personalising your products faster and easier than ever! No longer will you need to wait for our designers to create the design for you and go through rounds of changes as now you can instantly modify our amazing designs on your own. This easy to use tool allows you to alter text, colour and imagery to the way you want it. Below are the steps to get started! STEP 1) Select your preferred template to start. Once selected, this should take you straight down to the editing tool. 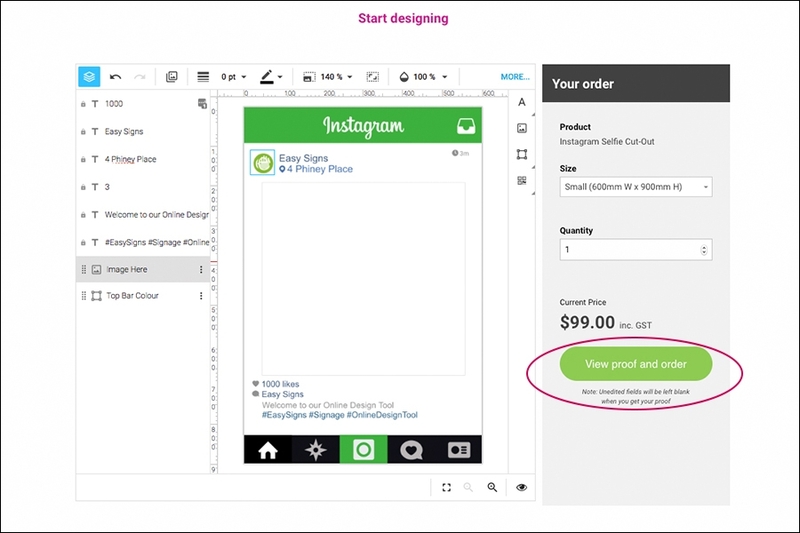 If you want to change your template, simply scroll back to the top and choose another one of our editable templates. 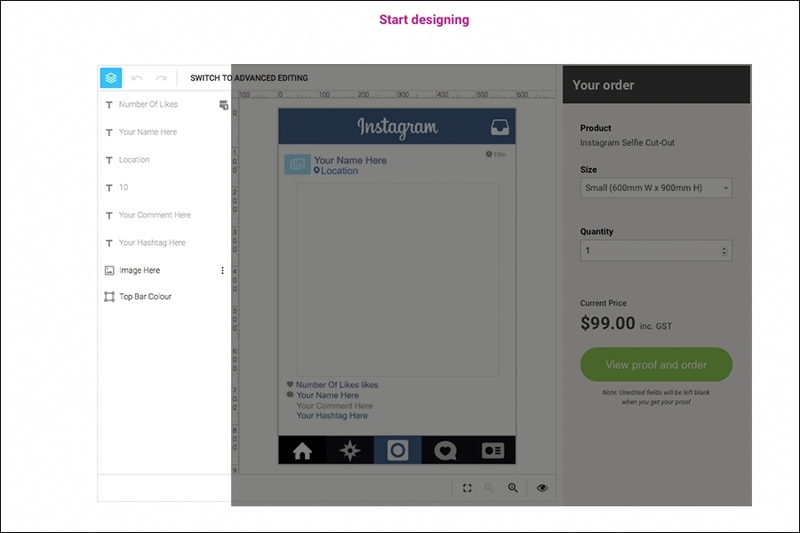 STEP 2) You should automatically be taken to our Online Design Tool that looks like this. Your selected template will be shown. STEP 3) On the right hand side, choose your product size and other finishing features if necessary. Before proceeding with your design, check that all information on the panel is correct. 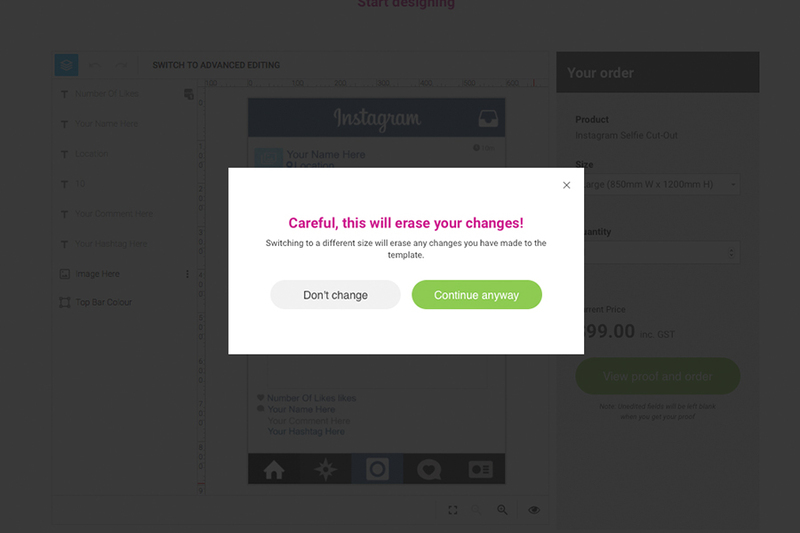 If you wish to change sizes, simply toggle the menu down and select the size you are after. 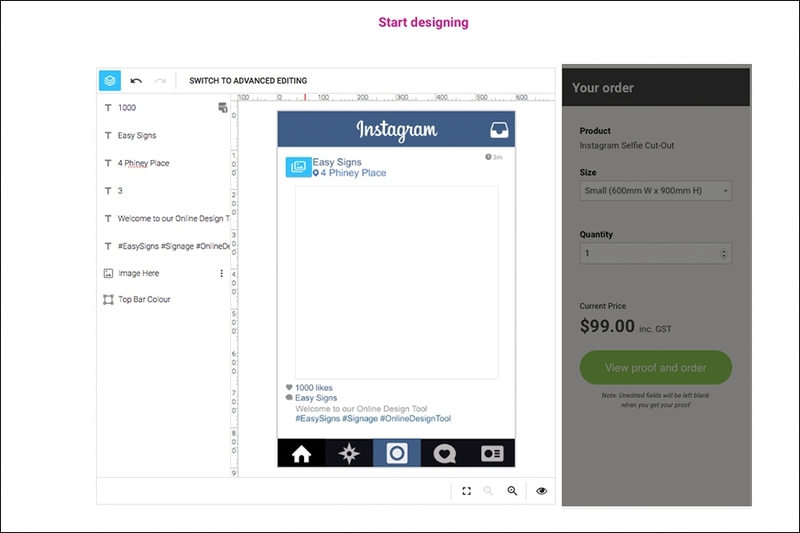 You will be taken to a screen to confirm your product size. 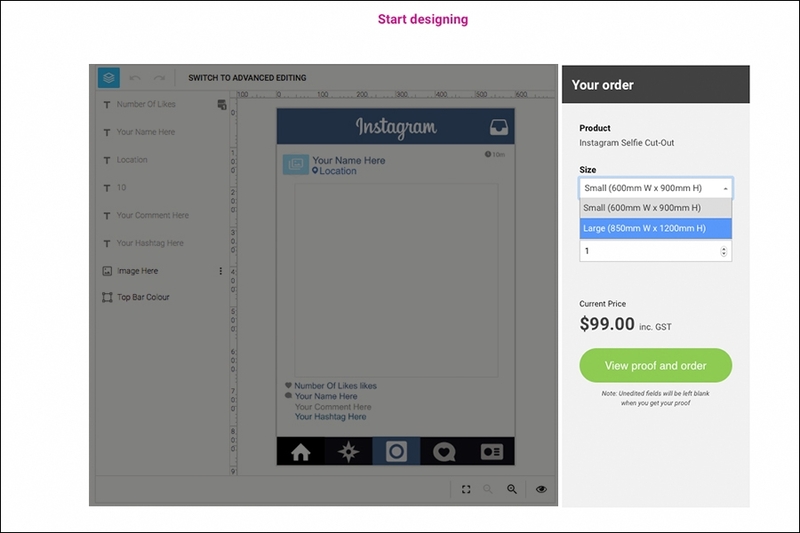 Please note that changing product sizes may require you to start your artwork from scratch again. STEP 4) Once you have your order information ready, you are at the exciting part! 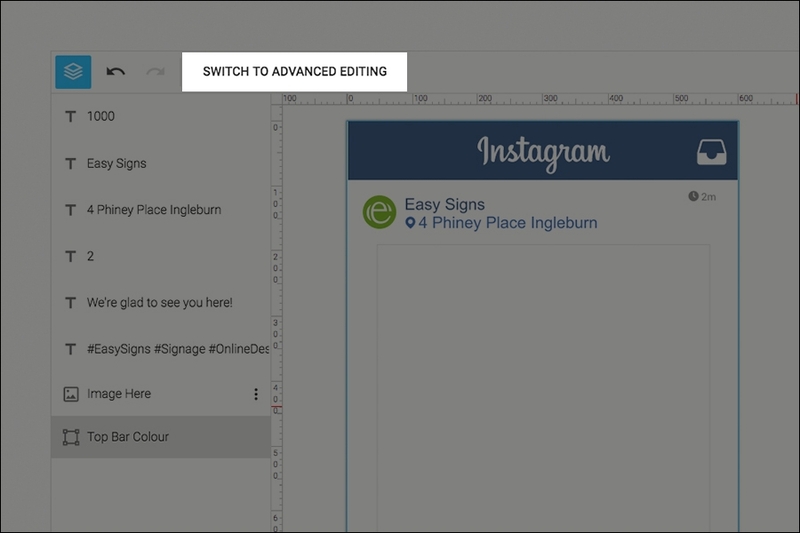 You can now start editing your template using the panel on the left or by clicking on editable areas on the canvas itself. Enter the details you want on your artwork in the corresponding fields. STEP 6) To add an image, click on the blue placeholder icon. You will be able to upload and select your image in the pop up menu. To adjust your image, click once on the image and drag it to your preferred position. 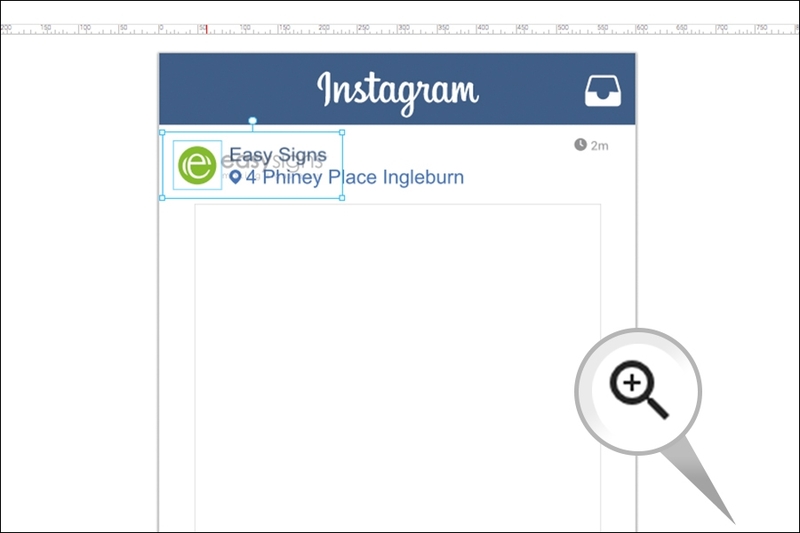 If you need to preview your design up close, click the magnify icon shown in the bottom footer menu. If you want to change your image, double click the image and the pop up menu will show. Step 7) Now your template should be almost polished! If you have any final touches such as text size, colour change and image scaling, you will need to Switch To Advanced Editing mode in the top tool bar as shown. 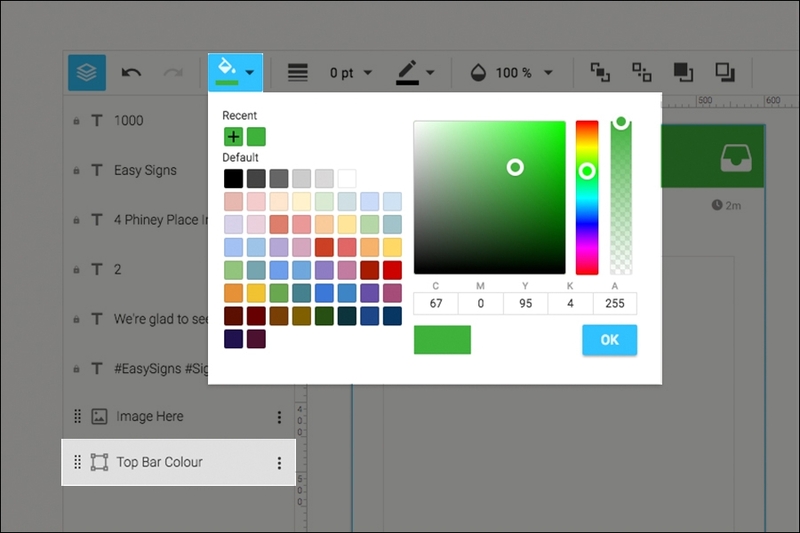 On most templates, you are able to change the colour of some features. In this example, you are able to change the colour of the Top Instagram Bar. To do this, you will need to Switch to Advanced Editing mode. Select the field that reads, ‘Top Bar Colour’ and click the paint bucket to choose your colour. Please note that these colours will be printed in CMYK so colours may differ on your monitor compared to the final print. Step 8) You should now have a brilliant looking design that you created on your own! 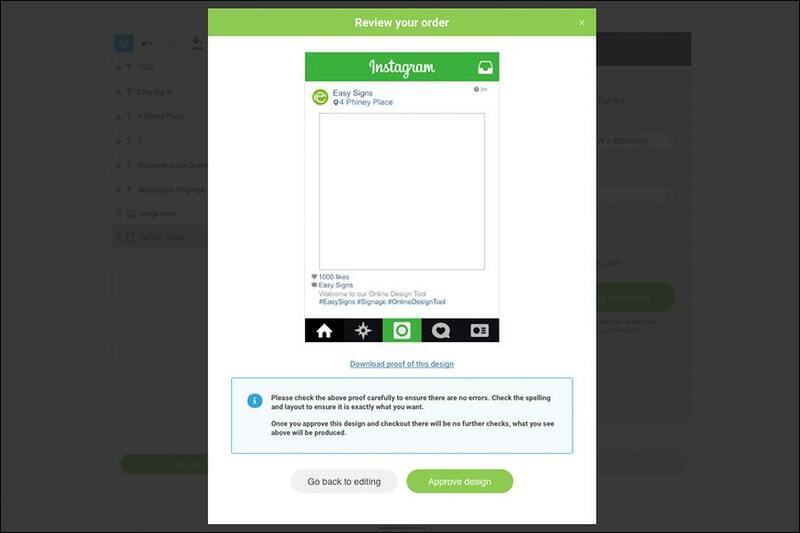 When you are ready, click ‘View proof and order’. 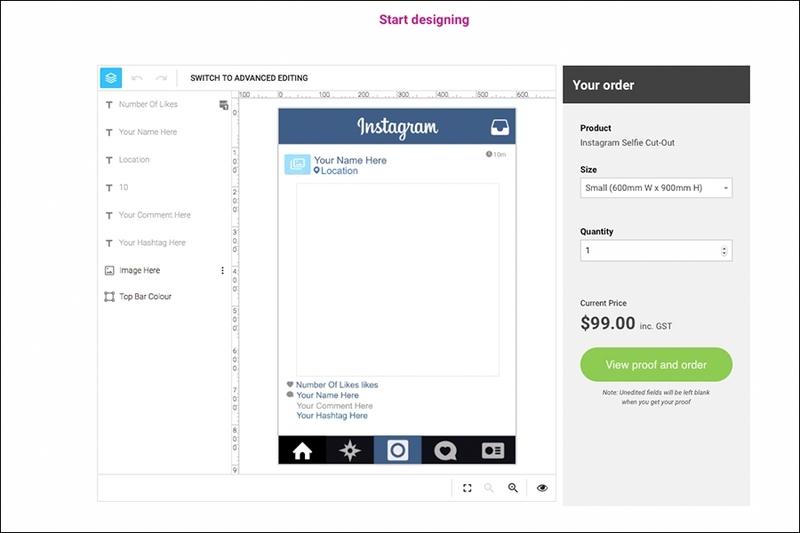 There will be a pop up to approve your design before you can place an order. Step 9) This is the approval pop up. Please check that your design is exactly how you want it. If you need a closer look, you are able to download the proof. If you require editing, click the Go Back to Editing button. 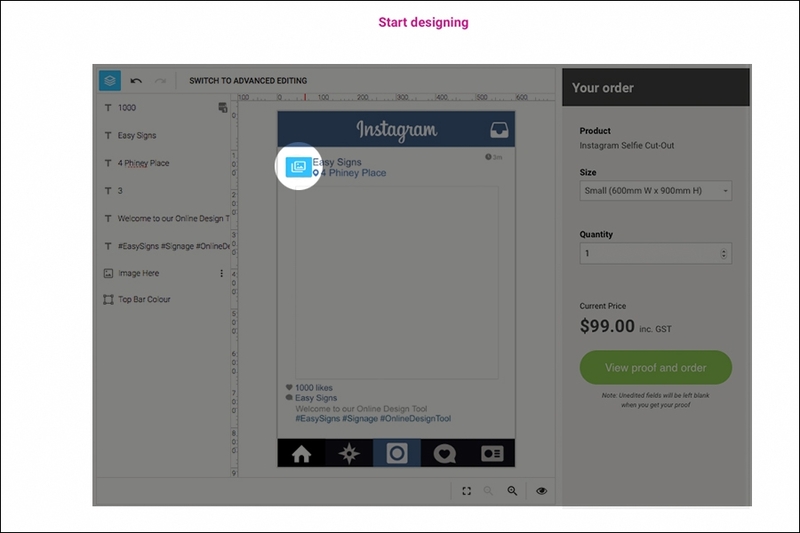 Once you’re happy with your design, click the Approve Design button to Order Now or Add the item to your cart. It’s that Easy! 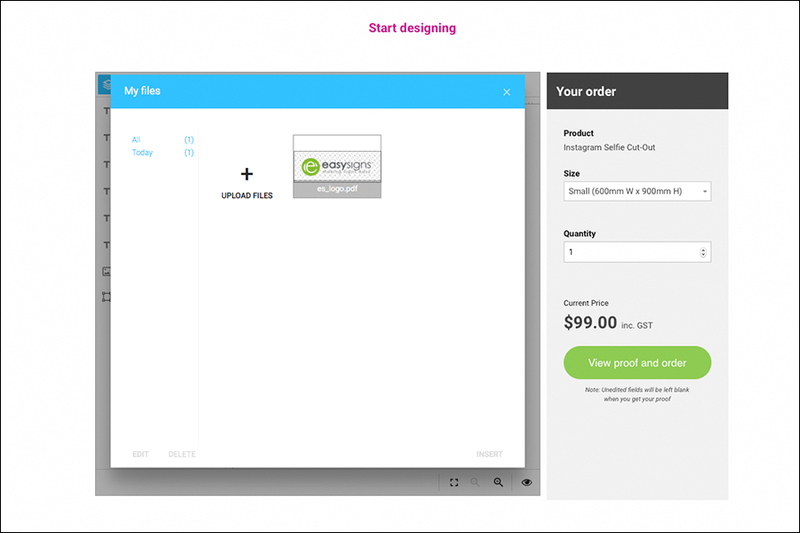 If you are only ordering products that you have approved the design online for, your job will be sent straight to our printers once you checkout and we will email you a copy of your invoice to make payment.